In the fall issue of NEWSpirit we plan to feature some innovative local church ministries that focus on education. In this back-to-school season, we're highlighting churches that: adopt schools; support and celebrate teachers; provide students and families with backpacks, school uniforms and supplies; or offer after-school tutoring and enrichment experiences, supplemental in-church learning programs, and other ministries. If your church, or a UM church you know of, has a ministry that supports or enhances education, please let us know about it, so we can share that good news with our readers. We'll publish some in our newspaper and others on the conference website. Please write to us at communications@epaumc.org (or jcoleman@epaumc.org) or call 484-762-8227. Hurricane Matthew, one of the fiercest hurricanes in nearly a decade, left a trail of destruction including nearly 1,000 dead in Haiti and up to 90 percent of some areas there destroyed, plus nearly 40 dead in the Southeast United States- from North Carolina to Florida. Some officials fear the toll may go higher. Two UM News Service stories report on the inaugural meeting, Oct. 7, in Chicago, of a new Wesleyan evangelical group that calls for a global witness of steadfast orthodoxy that may ultimately leave The United Methodist disunited. Eastern PA Conference churches offered a welcoming presence at Philadelphia's 26th annual OutFest parade on Sunday, Oct. 9, purportedly the nation's largest OutFest parade. The celebration preceded National Coming Out Day, on Tuesday, Oct. 11, when LGBTQ people are encouraged to openly share with family, friends and colleagues their sexual orientation and/or gender identity. Two churches hosted informative dialogues on racial justice and race relations on Thursday, Oct. 13. Covenant UMC in Lancaster hosted a Southwest District dialogue, from 6 to 8 PM, the second in a new series of clergy and lay talks that began August 29 at Grandview UMC in Lancaster. The district also gathered clergy for preliminary discussions about race in 2015. The August encounter drew nearly 40 people from 15 churches for guided discussions to help participants share experiences, questions and profound insights. Three clergy--Revs. Jason Perkowski, Andrea Brown and Derrick Gutierrez--co-lead the Southwest District Voices for Racial Justice Dialogue, which is open to all. Meanwhile, UM Church of the Open Door in Kennett Square hosts monthly race-related talks on second Thursdays, using TED Talks on Race videos as discussion-starters. The October session on Thursday, Oct. 13, at 5:30 PM featured the TED talk " We need to talk about an injustice - with Bryan Stevenson." On Thursday, Nov. 10, Adam Foss will offer A prosecutor's vision for a better justice system as a basis for discussion. The videos are only about 20 minutes long, and discussions are aimed at helping participants consider anti-racism actions they might take as a result. Everyone is invited to come participate. Note: Look for coverage about these and other racial justice and race relations dialogues being held around the conference in the future issues of NEWSpirit and on our website. What are you doing for Pastor Appreciation Month? Is your church is doing anything special to celebrate Pastor Appreciation Month in October? Please send us creative ideas, words of tribute for your pastor and celebratory photos. If we get some good stuff, we'll report it in Digest and post it on the conference website in a special Pastor Appreciation Month feature. Three special October events should spark interest among African American UM churches in Philadelphia. On Saturday, Oct. 15, 9 AM to 3 PM, the Philadelphia Mission ConneXion will sponsor a workshop on "ReThinking Leadership and Creating New Opportunities," led by the Rev. Micah Simms and targeted to black church leaders. 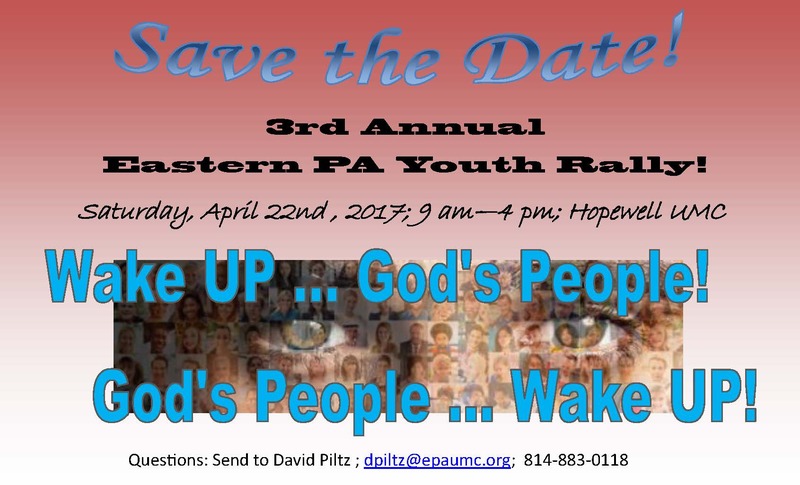 Mother Zoar UMC in Philadelphia will host the event. Registration is $25 for materials and lunch. On Sunday, Oct. 16, at 12:30 pm, Philadelphia's PBS-TV station, WHYY, Channel 12, will rebroadcast a 29-minute program of short films, including one titled "Charles Albert Tindley: Here Am I, Send Me." The nearly 13-minute film features the revered pastor who ministered to the community and built what became the famed Tindley Temple United Methodist Church. Part of a series of films depicting the Great Migration of Black Americans from the South, it looks at the history of Tindley Temple and how the visionary Rev. Tindley played a pivotal role in welcoming thousands of those sojourners to Philadelphia. The three-film program, which first aired Tuesday night, is part of the Scribe Video Center's Precious Places Community History Project, a local initiative to help communities document the public spaces and landmarks that define their neighborhoods. The Charles Albert Tindley Institute co-produced the Tindley film. WHYY will air the series of documentaries every Tuesday at 11 PM and Sundays at 12:30 PM for 26 weeks. And on Sunday, Oct. 23, at 3 PM, the Philadelphia Mission ConneXion will present its Joyful Noise Concert, at Mt. Zion UMC. There is no cost, but an offering will be received. Invited to perform at the concert is the very special Philadelphia UM Mass Choir, formed early this year. The mass choir will follow with its own Christmas Concert on Friday, Dec. 9, at 7 PM, at Wharton Wesley UMC. Holy Spirit (Espiritu Santo) UMC, 1441 E. Hunting Park Ave. (at Castor Ave.) in Philadelphia, will celebrate an extended Hispanic Heritage Worship Service on Sunday, Oct. 16, from 12 noon to 4 PM. The program will feature Dr. Elizabeth Conde-Frazier, Dean of Esperanza College, as the guest speaker, plus lively music, display tables adorned with cultural artifacts, and plenty of food (mucho comida) from various Latin American cultures. For information contact Rev. Esdras Seda, pastor and conference Latino Ministries Coordinator at eseda@epaumc.org. 5:00pm -Closing Worship Rally with Rev. Dawn Taylor-Storm, Southeast District Superintendent, preaching, and music by #JesusTrending. Note: The conference's Prison Ministry & Restorative Justice Team will have Christmas Cards for Prison Inmates on display at this event for attendees to sign and offer Christmas greetings. Mond ay, 9-11 AM, at Berwyn UMC. Bishop's meeting with laity, 7 PM, at Paoli UMC. st meeting with clergy Wednesday, 9:15 AM. Free Spirit, the NE District praise band, will lead worship, and an offering will be received for the Clergy Benevolence Fund. A laity event will be scheduled later. East District --Oct. 20, Bensalem UMC : Bishop's breakfast meeting with clergy Thursday, 8:30 am. Bishop's meeting & light supper with laity at 5 PM. Note: The conference's Prison Ministry & Restorative Justice Team will have Christmas Cards for Prison Inmates on display at all of these meetings for attendees to sign and offer Christmas greetings. Learn the essential ethical and legal dimensions of appropriate healthy boundaries for those serving in professional ministerial roles. Oct. 22, 9 AM - 3:30 PM at Conshohocken UMC. Mandatory for all persons seeking certification as candidates in ministry and for all other individuals beginning ministerial roles within the Eastern PA Conference. $35 fee includes light breakfast, lunch, and materials. Presenters are Dr. Donna Fiedler and Rev. Jose "Ricky" Ayala. Learn more and register. "Things Every Pastor Should Know." Oct. 29, 9 AM - 3 PM at Grandview UMC Lancaster. $35 fee. How to deal with a sexual misconduct crisis and other "what ifs" in the local church. Rev. Bev Andrews, a conference I-Care team member, will help participants create an "emergency preparedness kit." Learn more and register. Learn background, strategies and skills for changing attitudes and behaviors that perpetuate bias, discrimination and other obstacles to racial equity. Oct. 28-30 (Friday evening to Sunday afternoon) at Daylesford Abbey (New Location), 220 South Valley Road, Paoli. Registration is $300 payable when registering. 2 CEUs awarded upon completion. Learn more and register. Register now for the 2017 Peninsula-Delaware Conference Youth Rally, Jan. 6-8, at the Ocean City Convention Center. Online Registration is live! Online registration closes December 15, 2016. Afterward, tickets must be purchased at the door for $80 (with no t-shirt). Visit umyoungpeople.org/youth-rally and click the link on the right side of the page. Theme: "This Is Love" from 1 John 4:10. Featuring motivational speaker Steve Fitzhugh, a "champion for youth," along with Rend Collective, Zealand Worship Band, Dave & Brian, and a full concert by gospel singer Tasha Cobbs. Central District--Oct. 17; NE District--Oct. 19; and East District--Oct. 20.